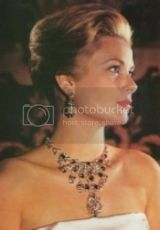 The most important tiara to come to auction in 30 years will be sold at Sotheby's Geneva on 17 May. Part of a sale of magnificent and noble jewels, the emerald and diamond tiara was created for Princess Katharina Henckel von Donnersmarck and is expected to sell for $5 million to $10 million. The highly important and extremely rare emerald and diamond tiara is composed of 11 exceptionally rare Colombian emerald pear-shaped drops which weigh over 500 carats in total, and may well have originally adorned the neck of a Maharajah. These emeralds are also believed to have been in the personal collection of Empress Eugénie. This superb tiara was commissioned, possibly from the renowned jewelers Chaumet, by Guido Count von Henckel, First Prince von Donnersmarck for his second wife Princess Katharina (1862-1929). Don´t like the emeralds. Looks like lollipops. is composed of 11 exceptionally rare Colombian emerald pear-shaped drops which weigh over 500 carats in total, and may well have originally adorned the neck of a Maharajah. I wonder if William will put a bid on it and then give it to Kate. if it was 5p perhaps. I was just going to say the same mousie. What a beautiful tiara, I love the emeralds so pretty.